Get an effective strength training at home or anywhere with GoFit's Rubber Resistance Training System. The GoFit Rubber Resistance Training System lets you purchase each item separately to create your own ultra-effective workout. As your training progresses, simply expand your system with more resistance options. For example, use one Door Anchor with a variety of Tubes or Bands depending on your particular workout. 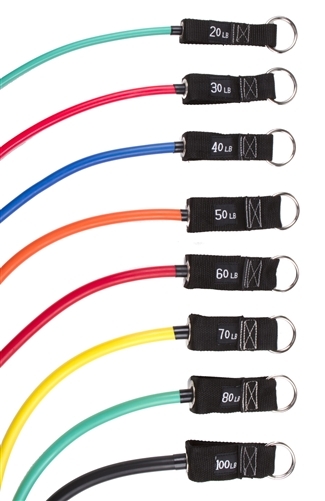 All components use a universal carabiner connection, so Handles, Door Anchors and Ankle Straps connect to Resistance Tubes and Bands in a snap, for an ultra-flexible training program. Important note: GoFit Power Tubes require GoFit Power Handles for use. 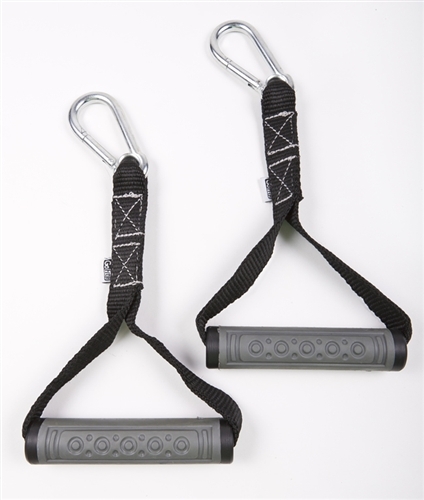 • Power Handles (sold separately as pair) A key element of this portable weight-resistance system are the GoFit Power Handles. • Door Anchor (sold separately) Get effective strength training at home or anywhere with GoFit's Rubber Resistance Training System. 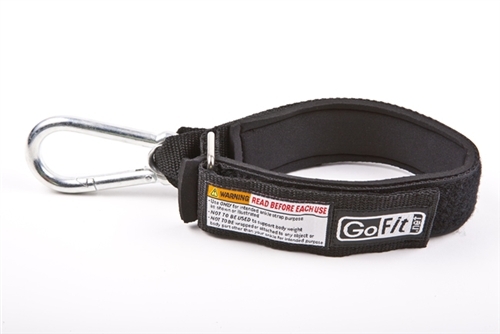 The GoFit Door Anchor is a key element of this portable weight-resistance system. To use, place It in your door jamb—per detailed instructions included with the product. Next, run your GoFit Power Tube or Super Band through the loop portion of the Door Anchor. Now, you can perform numerous exercises that require an anchored point to pull- or push-away from. The GoFit Door Anchor can be used in low- mid- and high-door positions for a variety of exercise options. 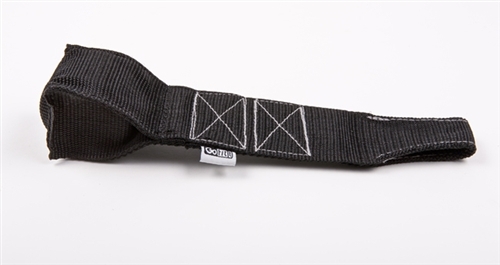 • Ankle Strap (sold separately) The GoFit Ankle Strap is a key element of this portable weight-resistance system. The Go Fit Ankle Strap quickly and conveniently let you use the Power Tubes and Super Bands for lower body exercises. • Power Tubes (sold separately) - Available weight resistances: 20 lbs., 30 lbs., 40 lbs., 50 lbs., 60 lbs., 70 lbs., 80 lbs., 100 lbs. 20-35 lbs., 30-50 lbs., 40-80 lbs., 50-120 lbs., 60-150 lbs. 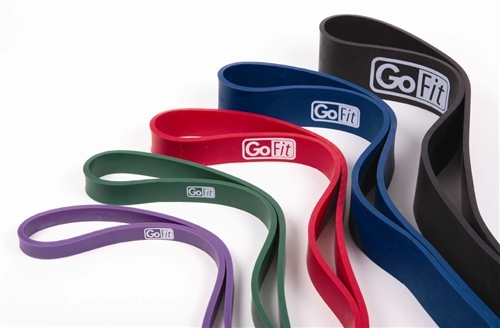 The GoFit Super Band’s continuous, 80" latex loop offers variable weight resistance with each band. Five Super Bands are available, each with a gradually greater weight range. You get virtually hundreds of resistance-exercise options. This all-encompassing, functional training tool is made of heavy duty, durable latex rubber. The 5mm-thick rubber resists tearing and its smooth pliable texture lets you keep your grip during exercise. The surface feels almost tacky to-the-touch, giving you the control you need). Included with each Band is a GoFit training manual booklet. You’ll get proper usage instruction, and a detailed, progressive workout guide, specially developed by Luke Richeson, head NFL Strength and Conditioning Coach. Coach Richeson has trained MLB Players, Olympians, Special Warfare Operatives, and numerous #1-NFL-draft-picks. Several exercise options are pictured with instructions and QR codes. Simply scan these codes with your smart phone to view video clips of each exercise. It’s all designed to help you get the most out of your GoFit Super Band, and reap real fitness benefits.